Riveting stuff in the National Portrait Gallery’s current exhibition of self-portraits. That look. The steely, sometimes sidelong, sometimes straight-on look. The deep, defiant, shifty look we only give ourselves. 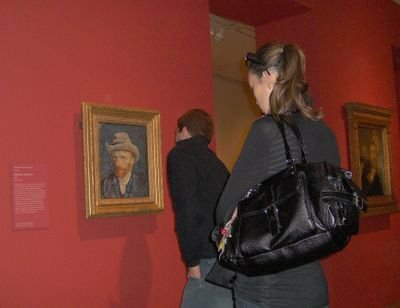 How unusually quiet the rather crowded gallery was, people murmuring at most in their companions’ ears, more often wrapped in their own trance of staring, catching, looking back. And then Mr Munch at the Royal Academy, also including many self-portraits. What a harsh, unblinking, but rarely unkind gaze into his own face. What unexpectedly glorious colour and pattern and cold, dense Northern light. Our fixation on The Scream seems like a typical media obsession with only the bad news. (okay, The Vampire is pretty unforgivable). So self-portrait paintings, the ultimate in self-obsession, reach out by compelling attention and empathy. Does the same apply to self-portraits in words? Which brings me back to qualms about self-exposing blog-posts, qualms which linger despite moving links and unexpected positive feedback. Oh well, done now. Let them go. Congratulations on "Post of the Week"! It's well deserved. YES! I echo Richard's words exactly. How wonderful, Jean. And, thank you. What's done is done. And it was well done. Congrats indeed! The self portrait certainly interesting - as much for what we choose to reveal as to conceal. And I agree with you, Richard. Our composing of ourselves & our lives through our blog writing is quite wonderful, often profound. But I do wonder if self portraiture is a genre that began at a point in time; I've been sitting here trying to think if the Greeks composed images of themselves, or the Romans, definitely not Byzantia, but by the Middle Ages? Did Chaucer put himself somewhere in the Canterbury Tales...? Or was the self portrait mainly a Renaissance development? Maybe I should paste these questions over at Jean's... surely addressed in the show she wrote of. Congratulations from me too, Jean! I recognise the honour was earned at a price, though. I'm with you re the internal debates about how much to disclose. Self-disclosure on my blog (and in comments on others) is like a fire hydrant with me, either full on and I feel I've revealed too much, or right off, and there's nothng of me, no warmth at all. I hope the balance will come with time. .. and FWIW, I think the posts you are concerned about were wonderful! Yes, Brenda, the London exhibition did indeed start with renaissance paintings and your question was one of those it sought to provoke, I think. But, as the late lamented blogger Abdul Walid of Acerbia remarked some time last year - so I can't put a link, damn him - self-portraits in words and bloggy-type personal writing go back much further... I remember he reminded me that in school Latin classes I loved the works of Pliny the Younger for all the reasons I love blogs. Thanks for the congratulations, all. Excellent photo you took of the Self Portrait show and your comments on it too. Did I already say that I went to it on Saturday? Grr, Blogger always does that with url's. Natalie's address ends with " /blaugustine.html "
And it's most interesting to consider that the self-reflection that we take for granted with our cameras essentially began at a certain point in history. That the way people perceived themselves before that was most likely quite different. What if you rarely or almost never saw a reflection of yourself? thanks for the links to munch. i looked more closely at the two self-portraits there - the younger munch, smoking a cigarette, seems almost disembodied, rising from a mist; the older munch, seems mirrored in the tall narrow clock: aging/consciousness of time. in the evening on karl johan, the sky looks like an eye, and with that rock formation, looks like a rather sinister face: the face of god? Two thoughts on self portraits. Having modeled for drawing classes, I noticed artists always drew themselves- I was reference, but what they produced expressed who they were. I think painters paint themselves because they are there. I write my own experiences because I have a right to them, like cutting my own hair. I need have no worries about anyone else's privacy. It is the raw material we each own. From cave outlines of hands to photos of ourselves in mirrors. So, I don't think it is necessarily narcissistic. Rather, I figure my inner life is not unique, and that I simply have a unique view on the pool of our collective un/ consciousness. I have a right, maybe even an obligation, to share with those who can connect.